Being the #1 G1000 installation center in the west, Eric's Leading Edge, Inc. has the know how and experience to give you a no nonsense installation that you can enjoy for years to come. Our retrofit package comes standard with the Mid-Continent Avionics & Instruments MD302 SAM solid state standby for a complete all glass panel. With seven highly cross trained staff, our installations are completed with a minimal downtime as low as 15 days without all the fluff the big shops charge! From start to finish of the retrofit and even after the job is completed, you will have access to Eric's & Mark's personal cell phones to provide you AOG tech support and answer any questions any time of the day, night, or even weekends. 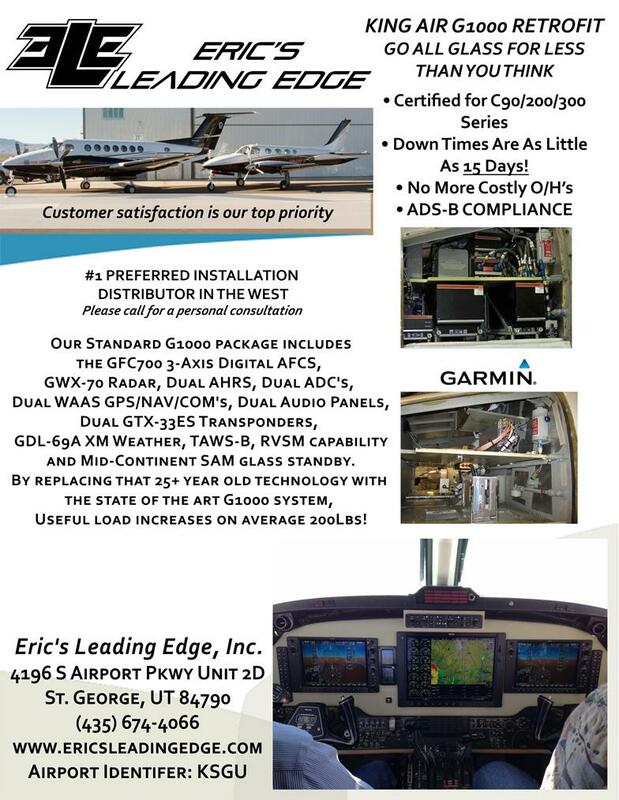 Here at Eric's Leading Edge, Inc. we don't concentrate on how many G1000's we can turn out, we concentrate on giving you the best service in the industry! The G1000 retrofit suite integrates all primary flight, navigation, weather, terrain, traffic, radio frequency, engine and fuel data readouts on large-format, high-definition LCDs. The cockpit layout features a central 15" multi-function display (MFD), flanked by 10.4" primary flight displays (PFDs) at the pilot and copilot positions. Because it integrates so many components into 1 system, the G1000 comes in at a weight far lower than most typical avionics installs. For added visual orientation, optional SVT is available with your G1000 retrofit. Using sophisticated graphics modeling, the system recreates a 3-D "virtual reality" database landscape on the pilot and copilot PFDs. Thus, SVT enables you to clearly visualize nearby flight and enroute navigation features - even in solid IFR or nighttime VFR conditions. The G1000 system for King Air also includes the revolutionary GFC 700, a 3-axis, fully digital, dual channel, fail passive Automatic Flight Control System (AFCS). The GFC 700 is capable of using all data available to G1000, enabling it to maintain airspeed references and optimize performance over the entire airspeed envelope. Because nothing's more important than the safety of you and your passengers, we offer Electronic Stability and Protection (ESP) as an option for new King Air 200, 300 and 350 series retrofits. ESP provides an additional layer of protection when hand flying the aircraft. Using the servos of the autopilot system, ESP applies a gentle corrective force to your yoke when it detects excessive pitch and roll. It also allows for coupled go arounds and can help protect from low airspeed when paired with a compatible angle of attack sensor. Other standard features of the King Air's G1000 suite include WAAS-certified GPS navigation, dual integrated solid-state Attitude and Heading Reference Systems (AHRS), and dual integrated RVSM-capable digital air data computers. For the King Air 200, 300 and 350 series, the G1000 retrofit will come with Reduced Vertical Separation Minimums (RVSM) access, allowing full utilization of the now-more-restrictive flight levels between 29,000 and 41,000 feet. With dual VOR/Localizer/Glideslope receivers and dual TSO-c146a WAAS-GPS receivers, you have more options when it comes to flying and landing your King Air. Thanks to WAAS - the FAA's Wide Area Augmentation System - thousands of previously fair-weather-only airports now have the potential to offer GPS-guided "glidepath" approaches down to ILS-comparable minimums. And the G1000-equipped King Air comes ready to fly WAAS with full Class 3 approach capability. The King Air G1000 MFD seamlessly integrates our built-in terrain, obstacles and navigation databases, providing a clear, concise picture of where you are and where you're heading. An additional Jeppesen® database supports onscreen navigation, communication and mapping functions. Using information from the terrain and US obstacles databases, G1000 displays color coding to graphically alert you when proximity conflicts loom ahead. Your G1000 also comes with Class-B TAWS (Terrain Awareness and Warning System) - or optional Class-A TAWS on new King Air 200, 300 and 350 series retrofits - for an extra margin of safety in the air. SafeTaxi®, a built-in database US or European airport diagrams, helps monitor your location on unfamiliar airports. And preloaded FliteCharts® provide electronic versions of AeroNav terminal procedures and approach plates for more than 2,900 US airports. With the GTX 33 transponder with extended squitter capability (optional on the King Air C90 and included on other series), the G1000 provides ADS-B out capabilities. When coupled with an optional traffic system like the GTS 825/855, the system also provides ADS-B in capabilities for comprehensive active traffic monitoring. In addition, the King Air G1000 suite comes standard with our GWX 70 digital color radar. With its advanced solid-state transmitter design eliminating the need for life limited magnetron tubes, the Garmin GWX 70 comprises the very latest and most reliable technology in onboard weather radar. You'll also have access to XM WX Satellite Weather services with the standard GDL 69A data link receiver. An XM subscription provides coverage for the entire US - with NEXRAD images, METARs, TAFs, TFRs, lightning, winds and more. Plus, you can even select and enjoy more than 170 audio channels of XM in-flight entertainment (subscription required). For international weather services, as well as text messaging and voice calling capabilities, simply add a GSR 56 Iridium satellite datalink to the system. An optional GDL 59 can also be implemented to transmit logged engine trend, exceedence, system maintenance and crew advisory system (CAS) data over Wi-Fi networks. Plus, the G1000 system is easily updated and upgraded, so you can be sure that it will last well into the future. And it's all backed by a 2-year warranty (and optional FliteLevel Extended Warranty), as well as our #1-ranked Product Support. Interested in learning more about the G1000 Retrofit?